We'll begin by stating that loading the website took about 5-6 seconds, which is very slow in today's terms and they need to step up their game because patience is a virtue that is slowly fading from society and it might cause potential customers to click away (honestly, we almost did). The design of buildmyviews.org is very dark and a little alarming (using red and black colors) yet very organized. We recommend changing from a black and red color combination to a more colorful design that is more user-friendly and less intimidating and alarming. Regardless, you can easily reach any page, and each page is divided into paragraphs and written well. The content on the site looks very well put-together and thought-out, which makes it easier for users to read through. This vendor offers three major services (along with a few others that don't seem to be working so we won't mention them in this review): Worldwide views, High retention views, and Targeted views. The prices for worldwide views are average when compared to other competitors and are perfectly reasonable. However, the targeted views and the high retention views come with a very expensive price tag, presumably because of the uniqueness of these two individual services. The only payment option is PayPal (we love having a verified secure payment option!) and their ordering process seems easy and intuitive. The website also mentions they have a 100% refund policy on all delayed delivery orders, which is nice to know. As previously mentioned, most of this supplier's services were not available for order (nor is there an estimate of when they will be available which we found very odd because why publish services that don't work without a "coming soon" date? ), so only the three available services were ordered. Delivery of all ordered services wasn't gradual enough, and all views were added fairly fast (1000 views from each service, delivered within 24 hours). The speediness of delivery is problematic for those looking to see a slow, gradual growth to their stats. During our testing of these services we had almost no drops, however we did lose 10% of each order within a week. 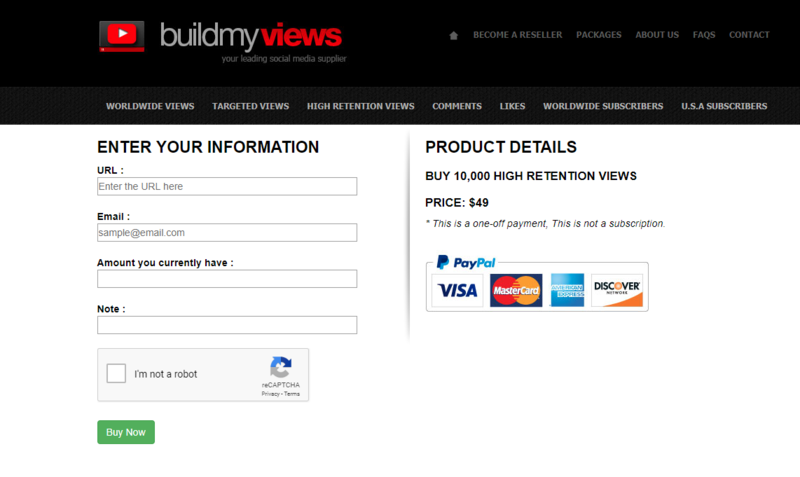 Fortunately, buildmyviews.org refilled all the orders. They don't provide any information regarding drops or refilling dropped services on the website, which we think is a shame because experiencing drops could seem quite terrifying to a new, unsuspecting user and reassurance is always a good thing and really important for the customer's overall experience. The support team does a good job. They answered us quickly, were very responsive and polite and gave answers to our questions. Overall we were satisfied with the support we had received and we truly have nothing bad to say about that aspect. They certainly pride themselves on their excellent support team and they have every reason to. The service description is quite fair and accurate, although they did not provide likes, comments and subscribers at the time of writing this review, only views (again, very strange in our opinion). They have a very vague FAQs page with a total of three questions and answers that are very general and don't feel informative at all. We were very confused by this, because usually the FAQs are where the information should be. Unfortunately, we give this site no more than 65/100. 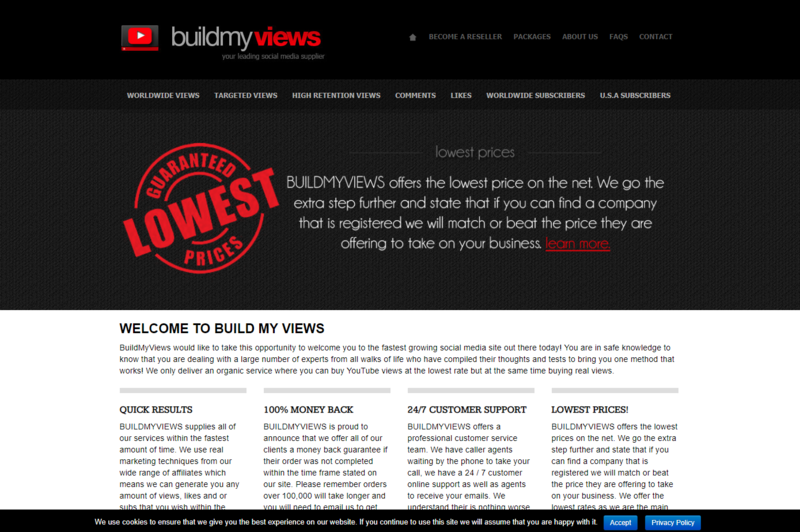 The only services available in buildmyviews.org are the views services - worldwide, targeted and high retention. Ironically enough, high retention views are somewhat of a standard when it comes to views services these days and competitors don't offer high retention separately - it's included in the views offered anyway. It's like selling chocolate-chip ice cream and seperating the ice cream itself from the chocolate chips (and charging more money, of course). The prices are very high for these services, and again - you can get the same outcome on different sites at a much lower price. There were almost no drops whatsoever, which is a really good thing, but if we had to pick we'll go for a site that offers all services in one package or a least a site that has all services available and doesn't feel like it's stuck in "development mode" forever.